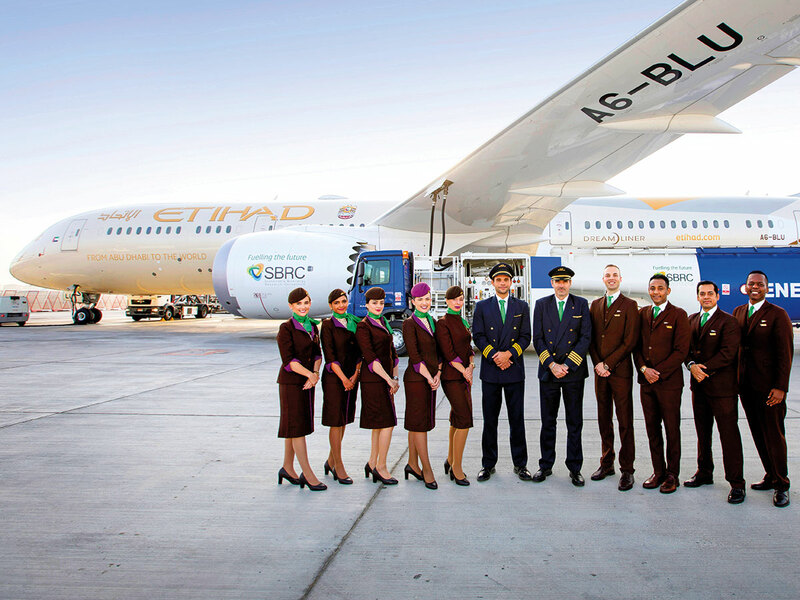 Abu Dhabi: Etihad Airways has flown the first commercial flight partially fuelled by locally produced biofuel derived from plants grown in saltwater, which reduces carbon emissions, officials announced here on Wednesday. The successful flight of the Etihad Airways Boeing 787 powered by GE’s GEnx-1B engines from Abu Dhabi to Amsterdam on Tuesday marked a major milestone, signalling the potential of large scale commercial production of biofuel in the UAE, which will cater to growing global demand for alternative aviation fuel, they said at a press conference on the sidelines of the Abu Dhabi Sustainability Week (ADSW). The officials of the Sustainable Bioenergy Research Consortium (SBRC), a non-profit entity established by Masdar Institute that is part of Khalifa University of Science and Technology, said the initiative would also address food security in the UAE as seafood is also produced through aquaculture as part of the process. The initiative named the Seawater Energy and Agriculture System (SEAS) supports the aviation sector, the oil and gas industry, food production and the creation of a new agricultural alternative in the UAE. “Deep decarbonisation of energy-intensive industries has a ripple effect on food security and climate action. Clean, alternative aviation fuels are an innovative and sustainable solution to significantly reducing harmful carbon emissions. The UAE is proud to be a pioneer in this domain,” said Dr Thani Bin Ahmad Al Zeyoudi, Minister of Climate Change and Environment. The biofuel fuel for the flight was derived from oil in Salicornia plants grown on the two-hectare farm in Masdar City as part of the SEAS, the world’s first desert ecosystem designed to produce fuel and food in saltwater. Fish and shrimp raised at the facility provide nutrients for the plants as well as contribute to the UAE’s food production. The system is expected to scale up to 200 hectares in the move towards full-scale commercial implementation in the next few years. She pointed out that the UAE has established its aquaculture sector with an investment of more than Dh100 million to develop hatcheries and fish farms. Tony Douglas, Group Chief Executive Officer Etihad Aviation Group, said the project has successfully proved a concept that is local, viable, cost-effective and sustainable. The biofuel is blended directly with jet fuel and does not require any modifications to aircraft, engines or airport fuelling delivery systems. The initiative utilises the oil and gas industry’s existing refining infrastructure. This has the potential to become an important new option for sustainable aviation fuel in the future. Biofuel is derived from salt-tolerant halophyte plants that are grown at the pilot facility in Abu Dhabi, which became operational in 2016. These plants thrive in desert conditions and do not require fresh water or arable land. Abu Dhabi National Oil Company (Adnoc)-Refining has provided the expertise and infrastructure for refining of the seed oil to meet stringent jet fuel standards. Adnoc distribution helped blending and delivery of the biofuel to the aircraft. Abu Dhabi Vegetable Oil Company (ADVOC) offered essential assistance in the pre-treatment phases.